On October 17, 2017, Panama’s President signed into law astonishing changes to Panama’s property tax rates. These reductions are expected to have a major impact on Panama real estate. We’ve been asked a lot of questions about what the law says and how each property owner will be personally affected. This article will answer many of your questions. It turns out that the ramifications are immensely positive. We believe it to be the biggest news in Panama real estate in years. Below you will see the new low tax rates for primary and secondary residences as well as the reduced rates for commercial properties. You will also hear about other major and surprising moves found in this law that strongly encourage investment in Panama real estate. 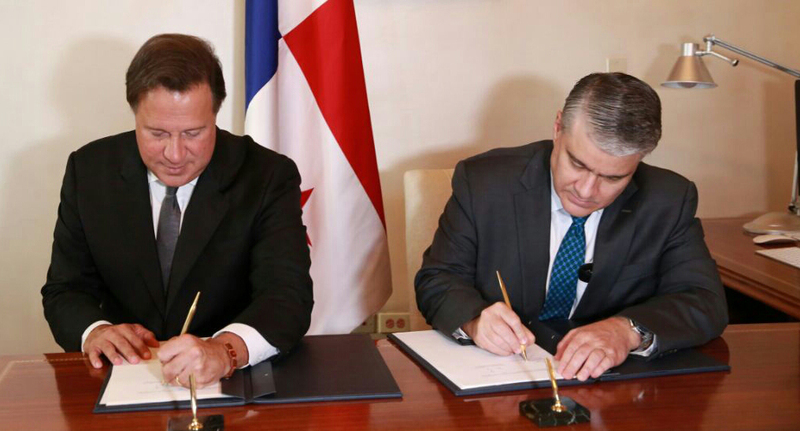 This surprising legislation is a bold and exciting next step for Panama real estate. — no taxes on the first $120,000 in registered property value. — 0.5% on the registered value of the property between $120,000 to $700,000. — 0.7% on the registered value of the property over $700,000. That means that a primary residence of $120,000 or less in value will never pay any property taxes. Primary residences over $120,000 will have a very low tax rate that will apply only to the amount over $120,000. See below the charts with the New Low Annual Property Taxes for properties based on their registered values. What Happens to the Current Tax Exemptions on Properties? Any properties that already have tax exemptions will be grandfathered in and will retain tax exemption status for the time already granted. In addition to dramatically lowering tax rates on properties, several other powerful moves were made to encourage investment in the real estate sector. They include a moratorium (forgiveness on past due tax penalties and interest if paid by the end of 2017), a major improvement in the agricultural tax exemption to $350,000 in registered value, and no government reassessing of any property values until at least June, 2024. Are Properties Not Owned in My Personal Name Eligible for the Low Rates? This law specifies that properties owned by corporations and foundations enjoy the same new low tax rates as those owned in people’s personal names. Corporations and foundations can be the owners of primary residences. According to the law, people who are unable to work or have reduced mobility causing them unable to work in a regular manner will enjoy no property taxes for the first $250,000 in registered value. Will The Government Be Doing Reassessments of Property? This law specifies that no property reassessments may be conducted anywhere in Panama until at least June, 2024, that no primary residences can be subject to reassessment even after that time and that any property reassessments for secondary residences and businesses if they occur must consider the property’s depreciation since construction. The full amount of the property taxes collected are now provided to the local governments throughout Panama for use in the improvement of the towns. This decentralization is designed to encourage infrastructure and road improvements throughout the country. Expect better utilities, community development and more road paving projects. Will There Be Tax Exemptions Available Anymore? A: Tax Exemptions For Up to 20 Years Will Still Available for Properties with Construction Permits Obtained before January 2019. Anyone who has an existing tax exemption will still get all the benefits of that exemption even for periods going beyond January 2019. For new construction, if you obtain a construction permit for a new house or other structure before January 2019, then you can still obtain a tax exemption under the current laws that could extend for up to 20 years depending on the value of construction. Under the new law that means you could get a construction permit as late as December, 2018 and still get a tax exemption even if your construction is not complete until much later into and beyond 2019. For primary residences, the first $120,000 is tax exempt. For commercial and secondary residences, the first $30,000. All values over those tax exempt will have greatly reduced tax rates. If I Am About to Get a Construction Permit or Plan One for Next Year, Can I Still Get a Tax Exemption? A: Yes. New Construction with Construction Permits Granted by December 2018 will still get the Tax Exemptions for up to 20 years. Even if you start construction much later than 2018, as long as you have a construction permit by December 2018, your property will remain eligible for a tax exemption. The actual number of years for the tax exemption will range from 5 to 20 years depending on the value of the construction. At some point, we anticipate there could be a time limit set as to when construction must be completed, but the current law does not provide a time limit. Since the new tax rates are so much lower, the current tax exemption system will not be available for new construction that does not receive a construction permit by the end of 2018. Of note: Even if a construction permit is obtained after January 2019, any primary residence of new construction for first time home buyers will still receive a three year tax exemption for up to $300,000 in value. The three year period will start from the date of occupancy permit or registration of the title, whichever is first. What is a Registered Value? The registered or catastral value is the value of a property as shown at the Panama tax office. Usually, the value matches that which also appears at Panama’s Public Registry. However, sometimes the values have not been updated causing a difference to be shown between those two systems. When buying or selling a property these amounts usually must be reconciled. If I Buy a Property by Buying a Corporation that Owns The Property, is the Price I Pay for the Property The Registered Value? Probably Not. The registered value is likely to be lower (sometimes much lower) than the price you paid for the corporation. When buying a corporation that owns a property, there is no change in the registered value at the tax office or Public Registry. Thus, if the registered value at the time you made the purchase of the corporation was lower than the price you paid, then the registered value was unchanged and your tax basis would be accordingly lower. — no taxes on the first $30,000 in registered property value. — 0.6% on the registered value of the property between $30,000 to $250,000. — 0.8% on the registered value of the property between $250,000 and $500,000. — 1.0% on the registered value of the property over $500,000. What about Condominiums and other Horizontal Property Regime (PH) Properties? Condominiums and related properties that are under the PH Horizontal Property Regime will enjoy all the same benefits as other properties except that the existing property taxes charged for the land that sits under the condo building will remain at the 1% tax rate. This usually translates to a very small tax to each individual condo owner since the value of the land is spread among many owners. Furthermore, most condos have individual property tax exemptions for each unit. When the tax exemption on each condo expires in the future, this law provides for the condo to no longer pay taxes on the land under the condo, but to pay the same rates as regular primary and secondary homes. Under the new law, if you pay all property taxes due for the year by the end of February, you will receive a 10% discount. Otherwise, you can make three payments as they come due through the course of the year. What is the New Agricultural Tax Exemption? The agricultural tax exemption has been greatly expanded to $350,000. Farms and properties that produce crops could benefit from this impressive expansion of the agricultural property tax exemption. Copyright Note: They say imitation is the highest form of flattery. Casa Solution original content has recently appeared on several competitor websites and newsletters. Please note that all commentary published in the Casa Solution newsletter is original content written, owned and copyrighted by Casa Solution unless an alternative source is specifically cited. If you wish to use content created by Casa Solution, please contact us and, in many cases, we will be pleased to permit use. Disclaimer: Bienes Raices Casa Solution SA and its employees, stock holders, and representatives are not experts in tax matters. We suggest that for any decisions related to taxes and legal matters that you independently confirm the above information and rely on the advice of a Panamanian attorney, accountant or other persons with expertise in tax and legal matters. El 17 de octubre de 2017, el Presidente de Panamá promulgó cambios asombrosos en las tasas de impuesto de propiedad de Panamá. Se espera que estas reducciones tengan un gran impacto en bienes raíces en Panamá. Nos han hecho muchas preguntas sobre lo que dice la ley y cómo cada propietario se verá afectado personalmente. Este artículo responderá muchas de sus preguntas. Resulta que las ramificaciones son inmensamente positivas. Creemos que es la noticia más importante en bienes raíces en Panamá en años. A continuación, verá las nuevas y reducidas tasas de impuestos para residencias primarias y secundarias, así como las tarifas reducidas para propiedades comerciales. También escuchará acerca de otros movimientos importantes y sorprendentes que se encuentran en esta ley que fomentan fuertemente la inversión en bienes raíces en Panamá. Esta sorprendente legislación es un siguiente paso audaz y emocionante para el sector inmobiliario de Panamá. – No hay impuestos sobre los primeros $120,000 en el valor registrado de la propiedad. – 0.5% sobre el valor registrado de la propiedad entre $120,000 a $700,000. – 0.7% sobre el valor registrado de la propiedad sobre $700,000. Eso significa que una residencia principal valorada en $120,000 o menos nunca pagará ningún impuesto a la propiedad. Las residencias primarias de más de $120,000 tendrán una tasa de impuestos muy baja que se aplicará sólo al monto superior a $120,000. A continuación verá las tablas con los Nuevos Bajos Impuestos de Propiedad Anuales para las propiedades basadas en sus valores registrados. ¿Qué sucede con las Exoneraciones de Impuesto Actuales en las Propiedades? Cualquier propiedad que ya tenga exoneración de impuestos quedará protegida y conservará el estado de exoneración de impuestos por el tiempo otorgado. ¿Cuándo Entra en Efecto la Ley? Además de reducir drásticamente las tasas de impuestos sobre las propiedades, se realizaron otras medidas importantes para alentar la inversión en el sector inmobiliario. Estos incluyen una moratoria (absolución de multas e intereses vencidos si se paga a fines de 2017), una importante mejora en la exoneración fiscal agrícola a $350,000 en valor registrado, y ningún gobierno reevaluará los valores de las propiedades hasta al menos Junio de 2024. ¿Las Propiedades que No Están Registradas a mi Propio Nombre son Elegibles para las Tarifas Bajas? Esta ley especifica que las propiedades a nombre de sociedades y fundaciones disfrutan de las mismas nuevas tasas bajas que aquellas registradas a título personal. Las Sociedades y las Fundaciones pueden ser los propietarios de las residencias principales. De acuerdo con la ley, las personas que no pueden trabajar o tienen movilidad reducida y no pueden trabajar de manera regular gozarán del beneficio de no pagar impuestos a la propiedad por los primeros $250,000 en valor registrado. ¿El Gobierno estará Haciendo Re avalúos de la Propiedad? Esta ley especifica que no se llevarán a cabo re avalúos de propiedad en Panamá hasta al menos Junio de 2024, que ninguna residencia principal puede ser reevaluada incluso después de ese momento y que si ocurre cualquier reevaluación de propiedad para residencias secundarias y negocios se debe considerar la depreciación de la propiedad desde su construcción. El monto total de los impuestos de propiedad recaudados ahora se proporcionará a los gobiernos locales en todo Panamá para su uso en la mejora de las comunidades. Esta descentralización está diseñada para fomentar las mejoras en infraestructura y mejoras viales en todo el país. Espere mejores servicios públicos, desarrollo comunitario y más proyectos de pavimentación de carreteras. ¿Seguirán estando disponibles las exoneraciones de impuestos? R: Las Exoneraciones de Impuestos de hasta 20 años seguirán disponibles para las Propiedades con Permisos de Construcción obtenidos antes de Enero de 2019. Cualquier persona que tenga una exoneración de impuestos existente aún obtendrá todos los beneficios de esa exoneración, incluso por períodos que van más allá de Enero de 2019. Para Construcciones Nuevas, si obtiene un Permiso de Construcción para una nueva Casa u otra Estructura antes de Enero de 2019, puede obtener una exoneración de impuestos según las leyes vigentes que podría extenderse hasta por 20 años, dependiendo del valor de la construcción. Según la nueva ley, eso significa que podría obtener un permiso de construcción hasta diciembre de 2018 y aun así obtener una exoneración de impuestos, incluso si su construcción no se completa hasta mucho más allá del 2019. Para residencias primarias, los primeros $120,000 están exentos de impuestos. Para residencias comerciales y secundarias, los primeros $30,000. Todos los valores sobre aquellos exentos de impuestos tendrán tasas de impuestos muy reducidas. Si estoy a punto de obtener un permiso de construcción o planeo obtener uno para el próximo año, ¿aun puedo obtener una exoneración de impuestos? A: Sí. Las construcciones nuevas con permisos de construcción otorgados antes de diciembre de 2018 aún recibirán las exenciones de impuesto hasta por 20 años. Incluso si comienza la construcción mucho después de 2018, siempre que tenga un permiso de construcción en o antes de Diciembre de 2018, su propiedad seguirá siendo elegible para una exoneración de impuestos. El número real de años para la exoneración de impuestos oscila entre 5 y 20 años, dependiendo del valor de la construcción. En algún momento, anticipamos que podría haber un límite de tiempo establecido para cuando se debe completar la construcción, pero la ley actual no establece un límite de tiempo. Dado que las nuevas tasas de impuestos son mucho más bajas, el sistema actual de exoneración de impuestos no estará disponible para nuevas construcciones que no reciban un permiso de construcción para fines de 2018. Nota: incluso si se obtiene un permiso de construcción después de Enero de 2019, cualquier residencia principal de nueva construcción para compradores por primera vez todavía recibirá una exoneración fiscal de tres años por un valor de hasta $300,000. El período de tres años comenzará a partir de la fecha de permiso de ocupación o registro del título, lo que ocurra primero. ¿Qué es el Valor Registrado? El valor registrado o catastral es el valor de una propiedad tal cual se muestra en la oficina de impuestos de Panamá. Por lo general, el valor coincide con el que también aparece en el Registro Público de Panamá. Sin embargo, a veces los valores no se han actualizado causando que se muestre una diferencia entre estos dos sistemas. Al comprar o vender una propiedad, estas cantidades generalmente deben conciliarse. Si Compro una Propiedad mediante la compra una Sociedad dueña de la Propiedad, ¿El Precio que Pago por la Propiedad es el Valor Registrado? Probablemente no. Es probable que el valor registrado sea más bajo (a veces mucho más bajo) que el precio que pagó por la Sociedad. Al comprar una sociedad que posee una propiedad, no hay ningún cambio en el valor registrado en la oficina de impuestos o el Registro Público. Por lo tanto, si el valor registrado en el momento en que realizó la compra de la sociedad fue menor que el precio que pagó, entonces el valor registrado no se modificó y su base de impuesto será en consecuencia menor. – No hay impuestos sobre los primeros $30,000 en valor registrado de la propiedad. – 0.6% sobre el valor registrado de la propiedad entre $30,000 a $250,000. – 0.8% sobre el valor registrado de la propiedad entre $250,000 y $500,000. – 1.0% sobre el valor registrado de la propiedad sobre $500,000. Consulte a continuación las tablas con los Nuevos Impuestos Anuales de Propiedad Reducidos para las propiedades basadas de sus valores registrados. ¿Qué hay acerca de los Condominios y Otras Propiedades del Régimen de Propiedad Horizontal (PH)? Los condominios y propiedades relacionadas que están bajo el Régimen de Propiedad horizontal o PH disfrutarán de todos los mismos beneficios que otras propiedades, excepto que los impuestos a la propiedad existentes cobrados por el terreno en el cual se ubica el edificio de condominio se mantendrán a la tasa de impuesto del 1%. Esto generalmente se traduce en un impuesto muy pequeño para cada propietario individual de condominio ya que el valor de la tierra se extiende entre muchos propietarios. Además, la mayoría de los condominios tienen exoneraciones de impuestos de propiedad individuales para cada unidad. Cuando la exoneración de impuestos en cada condominio vence en el futuro, esta ley estipula que el condominio ya no pagará impuestos sobre la tierra en la cual está construido el condominio, sino que pagará las mismas tasas que las viviendas primarias y secundarias regulares. Conforme a la nueva ley, si usted paga todos los impuestos de propiedad correspondientes al año en o antes de finales de febrero, usted recibirá un 10% de descuento. De lo contrario, puede hacer tres pagos a medida que vencen a lo largo del año. ¿Cuál es la nueva exoneración fiscal agrícola? La exoneración de impuestos agrícolas se ha ampliado considerablemente a $350,000. Las granjas y propiedades que producen cultivos podrían beneficiarse de esta impresionante expansión de la exoneración del impuesto a la propiedad agrícola. Nota de derecho de autor: Dicen que la imitación es la forma más alta de adulación. El contenido original de Casa Solution ha aparecido recientemente en varios sitios web y boletines de noticias de la competencia. Por favor tenga en cuenta que todos los comentarios publicados en el boletín informativo de Casa Solution son contenidos originales escritos, de propiedad y con derechos de autor de Casa Solution a menos que se cite específicamente una fuente alternativa. Si desea utilizar el contenido creado por Casa Solution, por favor contáctenos y, en muchos casos, nos complacerá permitir su uso. “… Los cambios entrarán en vigencia a partir del 1 de enero de 2019. Las tarifas son sustancialmente más bajas que las vigentes actualmente”. Exoneración de Responsabilidad: Bienes Raíces Casa Solution SA y sus colaboradores, accionistas y representantes no son expertos en materia de impuestos. Sugerimos que para cualquier decisión relacionada con impuestos y asuntos legales confirme independientemente la información anteriormente expuesta y se apoye en la opinión de un abogado Panameño, contable u otras personas con conocimiento en impuestos y materias legales.